Yay! Pike District Promenade is this Saturday! Join the fun this Saturday for a lovely stroll along the Trolley Trail. Perfect for all ages and pet-friendly, too! We meet at NoBe Market on the plaza between Seasons 52 and Starbucks at 10 am, Saturday, April 20. Free two-hour parking is available in the North Bethesda Market garages. YAY! Good weather predicted for Saturday’s Pike District Promenade! Comments Off on YAY! Good weather predicted for Saturday’s Pike District Promenade! Ok, the weather can’t be bad EVERY third Saturday of the month, right? Hopefully we’ll finally enjoy some good walking weather Saturday, March 16 at 10 am for our Pike District Promenade. 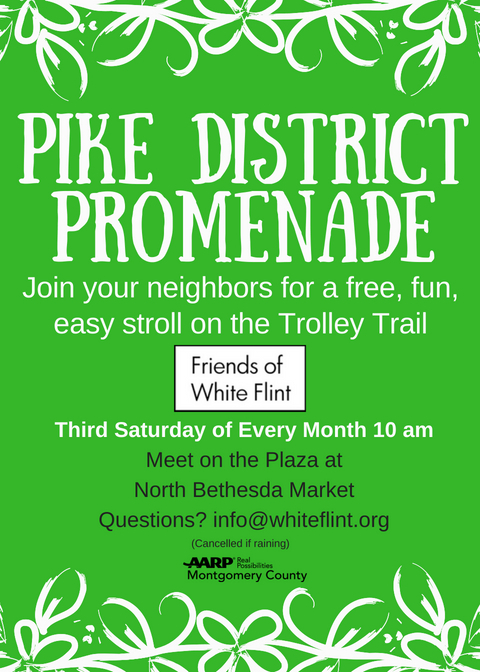 Once again, our monthly Pike District Promenade looks like it will be cancelled due to snow and rain on Saturday. Please put on your calendar March 16 (and cross your fingers for warm, sunny weather) for the next Pike District Promenade. Unfortunately, the weather is predicted to be rather lousy, so we’re cancelling tomorrow’s Pike District Promenade. Oh the weather it may be frightful but the walk will be so delightful. Comments Off on Oh the weather it may be frightful but the walk will be so delightful. Mark you calendar for our next Pike District Promenade, Saturday, December 15, 10 am. We’ll meet at the North Bethesda Market plaza between Starbucks, Seasons 52, and CVS. Dress warm and enjoy fresh air, great companionship, and holiday spirit! Mark you calendar for our next Pike District Promenade, Saturday, December 15, 10 am. We’ll meet at the NoBe Market plaza between Starbucks, Seasons 52, and CVS. Dress warm and enjoy fresh air, great companionship, and holiday spirit!